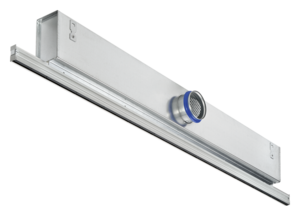 The type ALS Slot Diffuser is available with 1-6 slots. The diffuser face is attractively designed with extruded aluminium sections. 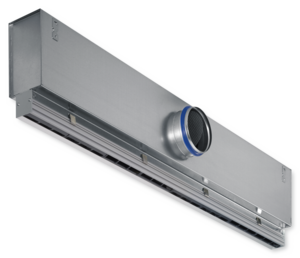 the ALS can be used in rooms with heights from approximately 2.60m to 4.00m for supply or extract air. Maximum recommended supply air temperature differential is 10K. 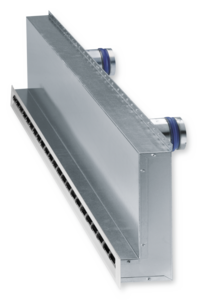 The slot diffuser provides a stable discharge and can be used for constant or variable volume air flows. 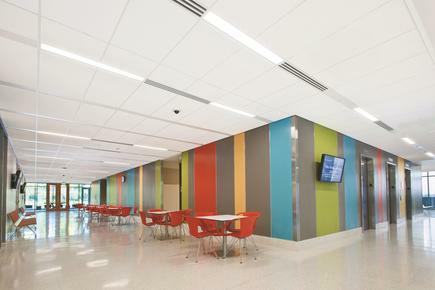 The PURELINE slot diffusers are neat devices that blend in perfectly with any ceiling. 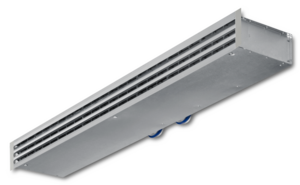 Adjustable air discharge – horizontal, angled or even vertical – makes the diffusers a versatile option for many applications, such as to provide an air curtain to protect fresh food counters. 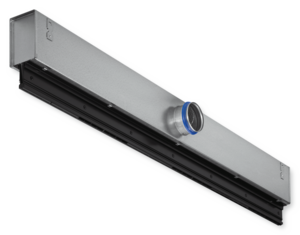 As a big plus, there is less contamination of the ceiling with the PURELINE slot diffusers. This has been tested on a dedicated test rig of RWTH Aachen University, where a standard dust (ASHRAE) was used to compare the contamination caused by different types of diffusers. PURELINE came out as the cleanest slot diffuser by far.